The provisions of the New York statutes that permit the filing of mechanics liens and materialman's liens can be found in New York's Construction Lien Law, § 3 et. seq. The full text of the New York Construction Lien Law is provided below, and has been updated as of 2011. 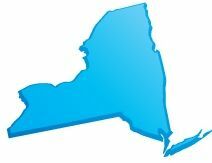 To see a quick synopsis of the most important provisions, take a look at our New York Frequently Asked Questions page. A contractor, subcontractor, laborer, materialman, landscape gardener, nurseryman or person or corporation selling fruit or ornamental trees, roses, shrubbery, vines and small fruits, who performs labor or furnishes materials for the improvement of real property with the consent or at the request of the owner thereof, or of his agent, contractor or subcontractor, and any trust fund to which benefits and wage supplements are due or payable for the benefit of such laborers, shall have a lien for the principal and interest, of the value, or the agreed price, of such labor, including benefits and wage supplements due or payable for the benefit of any laborer, or materials upon the real property improved or to be improved and upon such improvement, from the time of filing a notice of such lien as prescribed in this chapter. Where the contract for an improvement is made with a husband or wife and the property belongs to the other or both, the husband or wife contracting shall also be presumed to be the agent of the other, unless such other having knowledge of the improvement shall, within ten days after learning of the contract give the contractor written notice of his or her refusal to consent to the improvement. Within the meaning of the provisions of this chapter, materials actually manufactured for but not delivered to the real property, shall also be deemed to be materials furnished. (1) Such lien shall extend to the owner’s right, title or interest in the real property and improvements, existing at the time of filing the notice of lien, or thereafter acquired, except as hereinafter in this article provided. If an owner assigns his interest in such real property by a general assignment for the benefit of creditors, within thirty days prior to such filing, the lien shall extend to the interest thus assigned. If any part of the real property subjected to such lien be removed by the owner or by any other person, at any time before the discharge thereof, such removal shall not affect the rights of the lienor, either in respect to the remaining real property, or the part so removed. If labor is performed for, or materials furnished to, a contractor or subcontractor for an improvement, the lien shall not be for a sum greater than the sum earned and unpaid on the contract at the time of filing the notice of lien, and any sum subsequently earned thereon. In no case shall the owner be liable to pay by reason of all liens created pursuant to this article a sum greater than the value or agreed price of the labor and materials remaining unpaid, at the time of filing notices of such liens, except as hereinafter provided. (2) Such lien shall not extend to the owner’s right, title or interest in real property and improvements, existing at the time of filing the notice of lien if such lien arises from the failure of a lessee of the right to explore, develop or produce natural gas or oil, to pay for, compensate or render value for improvements made with the consent or at the request of such lessee by a contractor, subcontractor, materialman, equipment operator or owner, landscaper, nurseryman, or person or corporation who performs labor or furnishes materials for the exploration, development, or production of oil or natural gas or otherwise improves such leased property. Such lien shall extend to the improvements made for the exploration, development and production of oil and natural gas, and the working interest held by a lessee of the right to explore, develop or produce oil and natural gas. (3) Notwithstanding subdivision two if a property owner is also a developer of oil and gas resources and is a party to an agreement with a person or firm authorized to perfect a lien arising out of the failure of such developer to compensate or render value for improvements to the property upon which an oil or gas well is drilled or established, the lien shall extend to the owners’ right or interest in such real property. The proceeds of any insurance which by the terms of the policy are payable to the owner of real property improved, and actually received or to be received by him because of the destruction or removal by fire or other casualty of an improvement on which lienors have performed labor or services or for which they have furnished materials, shall after the owner has been reimbursed therefrom for premiums paid by him, if any, for such insurance, be subject to liens provided by this act to the same extent and in the same order of priority as the real property would have been had such improvement not been so destroyed or removed. The proceeds of any insurance which by the terms of the policy are payable to a contractor or subcontractor, and actually received or to be received by him because of the destruction or removal by fire or other casualty of an improvement on which he has performed labor or services or for which he has furnished materials, shall, after such contractor or subcontractor has been reimbursed therefrom for premiums paid by him, if any, for such insurance, be liable for the payment of demands for labor or services performed or materials furnished by his order and for which he is liable, in the same manner and under the same conditions as payments to him under his contract would have been had such improvement not been so destroyed or removed. Click Here to File a New York Document. A person performing labor for or furnishing materials to a contractor, his or her subcontractor or legal representative, for the construction or demolition of a public improvement pursuant to a contract by such contractor with the state or a public corporation, and any trust fund to which benefits and wage supplements are due or payable for the benefit of such person performing labor, shall have a lien for the principal and interest of the value or agreed price of such labor, including benefits and wage supplements due or payable for the benefit of any person performing labor, or materials upon the moneys of the state or of such corporation applicable to the construction or demolition of such improvement, to the extent of the amount due or to become due on such contract, and under a judgment of the court of claims awarded to the contractor for damages arising from the breach of such contract by the state, or awarded for furnishing labor or materials not contemplated by the provisions of said contract, upon filing a notice of lien as prescribed in this article, except as hereinafter in this article provided. Where no public fund has been established for the financing of a public improvement with estimated cost in excess of two hundred fifty thousand dollars, the chief financial officer of the public owner shall require the private entity for whom the public improvement is being made to post, or cause to be posted, a bond or other form of undertaking guaranteeing prompt payment of moneys due to the contractor, his or her subcontractors and to all persons furnishing labor or materials to the contractor or his or her subcontractors in the prosecution of the work on the public improvement. Any person who shall hereafter perform any labor for a railroad corporation shall have a lien for the value of such labor upon the railroad track, rolling-stock and appurtenances of such railroad corporation and upon the land upon which such railroad track and appurtenances are situated, by filing a notice of such lien in the office of the clerk of any county wherein any part of such railroad is situated, to the extent of the right, title and interest of such corporation in such property, existing at the time of such filing. The provisions of this article relating to the contents, filing and entry of a notice of a mechanic’s lien, and the priority and duration thereof, shall apply to such liens. A copy of the notice of such lien shall be personally served upon such corporation within ten days after the filing thereof in the manner prescribed by the justice court act for the service of summons in actions in justices’ courts against domestic railroad corporations. Any payment by the owner, contractor or subcontractor upon a contract for the improvement of real property, made prior to the time when, by the terms of the contract, such payment becomes due, for the purpose of avoiding the provisions of this article, shall be of no effect as against the lien of a subcontractor, laborer, or materialman under such contract, created before such payment actually becomes due. A conveyance, mortgage, lien or incumbrance made by an owner of real property, for the purpose of avoiding the provisions of this article, with the knowledge or privity of the person to whom the conveyance is made or in whose favor the mortgage, lien or incumbrance is created, shall be void and of no effect as against a claim on account of the improvement of such real property, existing at the time of the making of the conveyance or the creation of such mortgage, lien or incumbrance. Nothing in this chapter shall subject the title of a purchaser of real property for value whose conveyance is recorded prior to the filing of a lien pursuant to this chapter to any such lien, provided the instrument of conveyance contains the provisions mentioned in subdivision five of section thirteen. A statement of the terms of a contract made between an owner and a contractor, pursuant to which an improvement of real property is being made, and, of the amount due or to become due thereon shall be furnished upon demand in writing by the owner, or his duly authorized agent, to a subcontractor, laborer or material man performing labor for or furnishing materials to a contractor, or subcontractor, under such contract. If, within thirty days of such demand the owner refuses or neglects to furnish such statement or falsely states the terms of such contract or the amount due or to become due thereon, and a subcontractor, laborer or material man has not been paid the amount of his claim against a contractor or subcontractor, under such contract, and a judgment has been obtained and execution issued against such contractor or subcontractor and returned wholly or partly unsatisfied, the owner shall be liable for the loss sustained by reason of such refusal, neglect or false statement, and the lien of such subcontractor, laborer or material man, filed as prescribed in this article, against the real property improved for the labor performed or materials furnished after such demand, shall exist to the same extent and be enforced in the same manner as if such labor and materials had been directly performed for and furnished to such owner. The notice of lien shall state: 1. The name and residence of the lienor; and if the lienor is a partnership or a corporation, the business address of such firm, or corporation, the names of partners and principal place of business, and if a foreign corporation, its principal place of business within the state. 1-a. The name and address of the lienor’s attorney, if any. 2. The name of the owner of the real property against whose interest therein a lien is claimed, and the interest of the owner as far as known to the lienor. 3. The name of the person by whom the lienor was employed, or to whom he furnished or is to furnish materials; or, if the lienor is a contractor or subcontractor, the person with whom the contract was made. 4. The labor performed or materials furnished and the agreed price or value thereof, or materials actually manufactured for but not delivered to the real property and the agreed price or value thereof. 5. The amount unpaid to the lienor for such labor or materials. 6. The time when the first and last items of work were performed and materials were furnished. 7. The property subject to the lien, with a description thereof sufficient for identification; and if in a city or village, its location by street and number, if known. A failure to state the name of the true owner or contractor, or a misdescription of the true owner, shall not affect the validity of the lien. The notice must be verified by the lienor or his agent, to the effect that the statements therein contained are true to his knowledge except as to the matters therein stated to be alleged on information and belief, and that as to those matters he believes it to be true. 1. Notice of lien may be filed at any time during the progress of the work and the furnishing of the materials, or, within eight months after the completion of the contract, or the final performance of the work, or the final furnishing of the materials, dating from the last item of work performed or materials furnished; provided, however, that where the improvement is related to real property improved or to be improved with a single family dwelling, the notice of lien may be filed at any time during the progress of the work and the furnishing of the materials, or, within four months after the completion of the contract, or the final performance of the work, or the final furnishing of the materials, dating from the last item of work performed or materials furnished except that in the case of a lien by a real estate broker, the notice of lien may be filed only after the performance of the brokerage services and execution of lease by both lessor and lessee and only if a copy of the alleged written agreement of employment or compensation is annexed to the notice of lien, provided that where the payment pursuant to the written agreement of employment or compensation is to be made in installments, then a notice of lien may be filed within eight months after the final payment is due, but in no event later than a date five years after the first payment was made. For purposes of this section, the term “single family dwelling” shall not include a dwelling unit which is a part of a subdivision that has been filed with a municipality in which the subdivision is located when at the time the lien is filed, such property in the subdivision is owned by the developer for purposes other than his personal residence. For purposes of this section, “developer” shall mean and include any private individual, partnership, trust or corporation which improves two or more parcels of real property with single family dwellings pursuant to a common scheme or plan. The notice of lien must be filed in the clerk’s office of the county where the property is situated. If such property is situated in two or more counties, the notice of lien shall be filed in the office of the clerk of each of such counties. The county clerk of each county shall provide and keep a book to be called the “lien docket,” which shall be suitably ruled in columns headed “owners,” “ lienors,” “lienor’s attorney,” “property,” “amount,” “time of filing,” “proceedings had,” in each of which he shall enter the particulars of the notice, properly belonging therein. The date, hour and minute of the filing of each notice of lien shall be entered in the proper column. Except where the county clerk maintains a block index, the names of the owners shall be arranged in such book in alphabetical order. The validity of the lien and the right to file a notice thereof shall not be affected by the death of the owner before notice of the lien is filed. 2. Where the county clerk indexes liens in a block index, every notice of lien presented to the clerk of a county of filing, in order to entitle the same to be filed, shall contain in the body thereof, or shall have endorsed thereon, a designation of the number of every block, on the land map of the county, which is affected by the notice of lien. The county clerk shall cause such notice of lien to be entered in the block index suitably ruled to contain the columns listed in the preceding paragraph, under the block number of every block so designated. In cases where a notice of lien shall have been filed without such designation or with an erroneous designation, the county clerk, on presentation of proper proof thereof, shall enter such instrument in the proper index, under the proper block number of every block in which the land affected is situated, and shall, at the same time, make a note of such entry and of the date thereof in every place in which such instrument may have been erroneously indexed, opposite the entry thereof, and also upon the instrument itself, if the same be in his possession or produced to him for the purpose, and the filing of such instrument shall be constructive notice as to property in the block not duly designated at the time of such filing only from the time when the same shall be properly indexed. A county clerk may adopt a new indexing system utilizing electro-mechanical, electronic or any other method he deems suitable for maintaining the indexes. Within five days before or thirty days after filing the notice of lien, the lienor shall serve a copy of such notice upon the owner, if a natural person, (a) by delivering the same to him personally, or if the owner cannot be found, to his agent or attorney, or (b) by leaving it at his last known place of residence in the city or town in which the real property or some part thereof is situated, with a person of suitable age and discretion, or (c) by registered or certified mail addressed to his last known place of residence, or (d) if such owner has no such residence in such city or town, or cannot be found, and he has no agent or attorney, by affixing a copy thereof conspicuously on such property, between the hours of nine o’clock in the forenoon and four o’clock in the afternoon; if the owner be a corporation, said service shall be made (i) by delivering such copy to and leaving the same with the president, vice-president, secretary or clerk to the corporation, the cashier, treasurer or a director or managing agent thereof, personally, within the state, or (ii) if such officer cannot be found within the state by affixing a copy thereof conspicuously on such property between the hours of nine o’clock in the forenoon and four o’clock in the afternoon, or (iii) by registered or certified mail addressed to its last known place of business. Failure to file proof of such a service with the county clerk within thirty-five days after the notice of lien is filed shall terminate the notice as a lien. Until service of the notice has been made, as above provided, an owner, without knowledge of the lien, shall be protected in any payment made in good faith to any contractor or other person claiming a lien. 1. At any time before the construction or demolition of a public improvement is completed and accepted by the state or any political subdivision thereof, or by a public corporation or within thirty days thereof a person performing work for or furnishing materials to a contractor, his subcontractor, assignee or legal representative may file a written demand requiring notice of completion and acceptance be given to him upon the happening of such event. 2. Such demand shall be filed with the head of the department or bureau having charge of the construction or demolition. It shall state the name and address of the one making the demand; the name of the contractor or subcontractor for whom the labor was performed or materials furnished; the estimated amount of the entire value thereof; and a description of the public improvement upon which the labor was performed or the materials furnished. 3. Within five days of any completion and acceptance in respect to which a demand for notice has been filed pursuant to the provisions of this section the head of the department or bureau issuing the same shall cause written notice thereof to be mailed to the name and address of the one making the demand as recited therein. 4. The failure by the state, public corporation or any officer or employee thereof to give the notice required by this section shall not give rise to any cause of action; extend any period of time within which an act must be performed; or otherwise alter, affect or impair any other right or duty. Within five days before or thirty days after filing a notice of lien in accordance with section ten of this chapter or the filing of an amendment of notice of lien in accordance with section twelve-a of this chapter the lienor shall serve a copy of such notice or amendment by certified mail on the contractor, subcontractor, assignee or legal representative for whom he was employed or to whom he furnished materials or if the lienor is a contractor or subcontractor to the person, firm or corporation with whom the contract was made. A lienor having a direct contractual relationship with a subcontractor or a sub-subcontractor but not with a contractor shall also serve a copy of such notice or amendment by certified mail to the contractor. Failure to file proof of such a service with the county clerk within thirty-five days after the notice of lien is filed shall terminate the notice as a lien. Any lienor, or a person acting on behalf of a lienor, who fails to serve a copy of the notice of lien as required by this section shall be liable for reasonable attorney’s fees, costs and expenses, as determined by the court, incurred in obtaining such copy. Within five days before or simultaneously with filing a notice of lien in accordance with section twelve of this chapter or the filing of an amendment of a notice of lien in accordance with section twelve-a of this chapter with respect to a public improvement lien, the lienor shall serve a copy of such notice or amendment by certified mail on the contractor, subcontractor, assignee or legal representative for whom he was employed or to whom he furnished materials or if the lienor is a contractor or subcontractor to the person, firm or corporation with whom the contract was made. A lienor having a direct contractual relationship with a subcontractor or a sub-subcontractor but not with a contractor shall also serve a copy of such notice or amendment by certified mail to the contractor. The notice of lien so filed shall contain thereon or there shall be filed therewith proof of service of a copy of said lien upon the parties required to be served pursuant to this section, and failure to file proof of such service shall render the notice of lien a nullity. Any lienor, or a person acting on behalf of a lienor, who fails to serve a copy of the notice of lien as required by this section shall be liable for reasonable attorney’s fees, costs and expenses, as determined by the court, incurred in obtaining such copy. At any time before the construction or demolition of a public improvement is completed and accepted by the state or by the public corporation, and within thirty days after such completion and acceptance, a person performing work for or furnishing materials to a contractor, his subcontractor, assignee or legal representative, may file a notice of lien with the head of the department or bureau having charge of such construction or demolition and with the comptroller of the state or with the financial officer of the public corporation, or other officer or person charged with the custody and disbursements of the state or corporate funds applicable to the contract under which the claim is made. The notice shall state the name and residence of the lienor, the name of the contractor or subcontractor for whom the labor was performed or materials furnished, the amount claimed to be due or to become due, the date when due, a description of the public improvement upon which the labor was performed and materials expended, the kind of labor performed and materials furnished, and materials actually manufactured for but not delivered to such public improvement, and give a general description of the contract pursuant to which such public improvement was constructed or demolished. If the lienor is a partnership or a corporation, the notice shall state the business address of such partnership or corporation, the names of the partners, and if a foreign corporation, its principal place of business within the state. If the name of the contractor or subcontractor is not known to the lienor, it may be so stated in the notice, and a failure to state correctly the name of the contractor or subcontractor shall not affect the validity of the lien. The notice must be verified by the lienor or his agent, to the effect that the statements therein contained are true to his own knowledge, except as to the matters therein stated to be alleged on information and belief, and that as to those matters he believes it to be true. The comptroller of the state or the financial officer of the public corporation or other officer or person charged with the custody and disbursements of the state or corporate funds applicable to the contract under which the claim is made shall enter the same in a book provided for that purpose, to be called the “lien book”. Such entry shall include the name and residence of the lienor, the name of the contractor or subcontractor, the amount of the lien and date of filing, and a brief designation of the contract under which the lien arose. 1. Within sixty days after the original filing, a lienor may amend his lien upon twenty days notice to existing lienors, mortgagees and the owner, provided that no action or proceeding to enforce or cancel the mechanics’ lien has been brought in the interim, where the purpose of the amendment is to reduce the amount of the lien, except the question of wilful exaggeration shall survive such amendment. 2. In a proper case, the court may, upon five days’ notice to existing lienors, mortgagees and owner, make an order amending a notice of lien upon a public or private improvement, nunc pro tunc. However, no amendment shall be granted to the prejudice of an existing lienor, mortgagee or purchaser in good faith, as the case may be. (1) A lien for materials furnished or labor performed in the improvement of real property shall have priority over a conveyance, mortgage, judgment or other claim against such property not recorded, docketed or filed at the time of the filing of the notice of such lien, except as hereinafter in this chapter provided; over advances made upon any mortgage or other encumbrance thereon after such filing, except as hereinafter in this article provided; and over the claim of a creditor who has not furnished materials or performed labor upon such property, if such property has been assigned by the owner by a general assignment for the benefit of creditors, within thirty days before the filing of either of such notices; and also over an attachment hereafter issued or a money judgment hereafter recovered upon a claim, which, in whole or in part, was not for materials furnished, labor performed or moneys advanced for the improvement of such real property; and over any claim or lien acquired in any proceedings upon such judgment. Such liens shall also have priority over advances made upon a contract by an owner for an improvement of real property which contains an option to the contractor, his successor or assigns to purchase the property, if such advances were made after the time when the labor began or the first item of material was furnished, as stated in the notice of lien. If several buildings are demolished, erected, altered or repaired, or several pieces or parcels of real property are improved, under one contract, and there are conflicting liens thereon, each lienor shall have priority upon the particular part of the real property or upon the particular building or premises where his labor is performed or his materials are used. Persons shall have no priority on account of the time of filing their respective notices of liens, but all liens shall be on a parity except as hereinafter in section fifty-six of this chapter provided; and except that in all cases laborers for daily or weekly wages shall have preference over all other claimants under this article. An assignee of moneys or any part thereof, due or to become due under a contract for the improvement of real property, whose assignment is duly filed prior to the filing of a notice of lien or assignment of every other party to the action, shall have priority over those parties to the extent of moneys advanced upon such assignment before the filing of the notice of lien or assignment next subsequent to his assignment, but as to moneys advanced subsequent to a notice of lien or assignment filed and unsatisfied or not discharged such assignee for the purpose of determining his proportionate share of moneys available for distribution as provided in subdivision one of this section shall be treated as a lienor having a lien to the extent of moneys so advanced. An assignee of moneys or any part thereof, due or to become due under a contract for an improvement of real property whose assignment is duly filed subsequent to the filing of the notice of lien or assignment of any other party shall for the purpose of determining his proportionate share of moneys available for distribution, as provided in subdivision one of this section be treated as a lienor having a lien to the extent of moneys actually advanced upon such assignment prior to the filing thereof. (2) When a building loan mortgage is delivered and recorded a lien shall have priority over advances made on the building loan mortgage after the filing of the notice of lien; but such building loan mortgage, whenever recorded, to the extent of advances made before the filing of such notice of lien, shall have priority over the lien, provided it or the building loan contract contains the covenant required by subdivision three hereof, and provided the building loan contract is filed as required by section twenty-two of this chapter. Every mortgage recorded subsequent to the commencement of the improvement and before the expiration of the period specified in section ten of this chapter for filing of notice of lien after the completion of the improvement shall, to the extent of advances made before the filing of a notice of lien, have priority over liens thereafter filed if it contains the covenant required by subdivision three hereof. The lien of a vendee under an executory contract for the sale of land and the improvement thereof by the construction of a building thereon shall, to the extent of amounts paid thereunder to the vendor before the filing of a notice of lien, have priority over liens filed after the contract or memorandum thereof is recorded as provided in section two hundred ninety-four of the real property law if the recorded contract or memorandum specifies the total amount of payments made by the vendee or required by the contract to be made by the vendee before conveyance of title. (4) Nothing in subdivision two or three of this section shall apply to any mortgage given by a purchaser for value from an owner making the improvement and recorded prior to the filing of a lien pursuant to this chapter, provided the instrument of conveyance contains the provisions mentioned in subdivision five herein. Except that this section shall not apply to any mortgage taken by the home owners’ loan corporation,1 a corporation created under an act of congress, known as the “home owners’ loan act of nineteen hundred thirty-three,”2 and the “home owners’ loan act of nineteen hundred thirty-three as amended,”3 and said mortgage shall have priority over any and all liens filed subsequent to the date of the recording of said mortgage whether or not the cash and/or bonds for which said mortgage has been taken as security, shall have been advanced at the time of the execution of such mortgage or subsequent thereto, and it shall not be necessary to execute and file any building loan contract or any other contract, in compliance with this section or any part thereof. (6) Every assignment of moneys, or any part thereof, due or to become due under a contract for the improvement of real property shall contain a covenant by the assignor that he will receive any moneys advanced thereunder by the assignee and will hold the right to receive such moneys as trust funds to be first applied to the payment of trust claims as defined in section seventy-one of the lien law, and that he will apply the same to such payments only, before using any part of the moneys for any other purpose. A lien, filed as prescribed in this article, may be assigned by a written instrument signed and acknowledged by the lienor, at any time before the discharge thereof. Such assignment shall contain the names and places of residence of the assignor and assignee, the amount of the lien and the date of filing the notice of lien, and be filed in the office where the notice of the lien assigned is filed. The facts relating to such an assignment and the names of the assignee shall be entered by the proper officer in the book where the notice of lien is entered and opposite the entry thereof. Unless such assignment is filed, the assignee need not be made a defendant in an action to foreclose a mortgage, lien or other incumbrance. A payment made by the owner of the real property subject to the lien assigned or by his agent or contractor, or by the contractor of a public corporation, to the original lienor, on account of such lien, without notice of such assignment and before the same is filed, shall be valid and of full force and effect. Except as prescribed herein, the validity of an assignment of a lien shall not be affected by a failure to file the same. 1. No assignment of one or more contracts for the performance of labor or the furnishing of materials for the improvement of real property or of the money or any part thereof due or to become due therefor, nor an order drawn by a contractor upon the owner of such real property for the payment of such money, nor an order drawn by a subcontractor upon a contractor or subcontractor for such payment, nor an order drawn by an owner upon the maker of a building loan, nor an assignment of moneys due or to grow due under a building loan contract, shall operate to reduce the lien of a subcontractor, laborer or materialman, except as provided in sections thirteen and twenty-six of this chapter; nor shall any such assignment or order be valid for any purpose, unless a “Notice of Assignment” meeting the requirements of subdivision two of this section or the contract (other than a building loan contract) or a statement containing the substance thereof and such assignment or a copy of each or a copy of such order, be filed within ten days after the date of such assignment or such order, in the office of the county clerk of each county wherein real property improved or to be improved to which the assignment or order relates is situated and such assignment or order shall have effect and be enforceable from the time of such filing, and no such assignment or order shall have any validity until the same shall have been so filed, and every such assignment or order, not filed shall be absolutely void as against a subsequent assignee in good faith and for valuable consideration, whose assignment or order is first duly filed. Such clerk shall enter the facts relating to such assignment or order in the “lien docket” or in another book provided by him for such purpose. Each such assignment shall be indexed by the name of the assignor and each such order shall be indexed by the name of the drawer. 2. A “Notice of Assignment” filed pursuant to subdivision one of this section shall be used only in the case of money advanced or to be advanced to a contractor or subcontractor upon the assignment of one or more contracts for the performance of labor or the furnishing of materials for the improvement of real property, or of the money or any part thereof due or to become due therefor. The said notice shall contain (a) the names and addresses of the assignor and assignee, (b) the date of the assignment, and the date the assignment will terminate, which termination date shall not be more than two years after the date of the assignment, (c) the maximum balance of advances outstanding to be secured by the assignment, (d) a statement of each county wherein the real property involved in the contracts is or may be situated, and (e) either a specific description of the substance of the contract or contracts assigned, including an identification of the real property involved in each such contract, or a statement that the assignment covers all or a specified class of the assignor’s accounts or contract rights. If the contract or contracts assigned are described specifically the real property identification shall be sufficient if it includes the name of the record owner and the location of the real estate by street and number and town or city or, if the real estate is in the city of New York, by county, except that if the real estate is in the city of New York or counties of Nassau or Onondaga, where the block system of recording or registering and indexing conveyances is in use, the notice must also specify the block in which the real estate is situated. No assignment of a contract for the performance of labor or the furnishing of materials for a public improvement, or of the money, or any part thereof, due, or to become due, therefor, nor an order drawn by the contractor or sub-contractor upon the public corporation, or the head of the department or bureau having charge of the construction or demolition of such public improvement, or the financial officer of the public corporation, or other officer or person charged with the custody and disbursement of the corporate funds applicable to the contract for such public improvement, shall be valid unless such assignment or order, or a copy thereof, be filed within twenty days after the date of such assignment of contract, or such assignment of money, or such order, with the head of the department or bureau having charge of such construction or demolition, and with the financial officer of the public corporation or other officer or person charged with the custody and disbursement of the corporate funds applicable to the contract for such public improvement, and such assignment or order shall have effect and be enforceable from the time of such filing, and no such assignment or order shall have any validity until the same shall have been so filed, and every such assignment or order, not filed, shall be absolutely void as against a subsequent assignee in good faith and for valuable consideration, whose assignment or order is first duly filed. The financial officer of the public corporation, or other officer or person with whom the assignment order, or copy thereof, is filed, shall enter the facts relating to the same in the lien book or other book provided for such purpose. No lien specified in this article shall be a lien for a longer period than one year after the notice of lien has been filed, unless within that time an action is commenced to foreclose the lien, and a notice of the pendency of such action, whether in a court of record or in a court not of record, is filed with the county clerk of the county in which the notice of lien is filed, containing the names of the parties to the action, the object of the action, a brief description of the real property affected thereby, and the time of filing the notice of lien; or unless an extension to such lien, except for a lien on real property improved or to be improved with a single family dwelling, is filed with the county clerk of the county in which the notice of lien is filed within one year from the filing of the original notice of lien, continuing such lien and such lien shall be redocketed as of the date of filing such extension. Such extension shall contain the names of the lienor and the owner of the real property against whose interest therein such lien is claimed, a brief description of the real property affected by such lien, the amount of such lien, and the date of filing the notice of lien. No lien shall be continued by such extension for more than one year from the filing thereof. In the event an action is not commenced to foreclose the lien within such extended period, such lien shall be extinguished unless an order be granted by a court of record or a judge or justice thereof, continuing such lien, and such lien shall be redocketed as of the date of granting such order and a statement made that such lien is continued by virtue of such order. A lien on real property improved or to be improved with a single family dwelling may only be extended by an order of a court of record, or a judge or justice thereof. No lien shall be continued by court order for more than one year from the granting thereof, but a new order and entry may be made in each of two successive years. If a lienor is made a party defendant in an action to enforce another lien, and the plaintiff or such defendant has filed a notice of the pendency of the action within the time prescribed in this section, the lien of such defendant is thereby continued. Such action shall be deemed an action to enforce the lien of such defendant lienor. The failure to file a notice of pendency of action shall not abate the action as to any person liable for the payment of the debt specified in the notice of lien, and the action may be prosecuted to judgment against such person. The provisions of this section in regard to continuing liens shall apply to liens discharged by deposit or by order on the filing of an undertaking. Where a lien is discharged by deposit or by order, a notice of pendency of action shall not be filed. A lien, the duration of which has been extended by the filing of a notice of the pendency of an action as above provided, shall nevertheless terminate as a lien after such notice has been canceled as provided in section sixty-five hundred fourteen of the civil practice law and rules or has ceased to be effective as constructive notice as provided in section sixty-five hundred thirteen of the civil practice law and rules. If the lien is for labor done or materials furnished for a public improvement, it shall not continue for a longer period than one year from the time of filing the notice of such lien, unless an action is commenced to foreclose such lien within that time, and a notice of the pendency of such action is filed with the comptroller of the state or the financial officer of the public corporation with whom the notice of such lien was filed; or unless an extension to such lien is filed with the comptroller of the state or the financial officer of the public corporation with whom the notice of such lien was filed within one year from the filing of the original notice of lien, continuing such lien and such lien shall be redocketed as of the date of filing such extension. Such extension shall contain the names of the lienor and the contractor or subcontractor for whom the labor was performed or materials furnished, a description of the public improvement upon which the labor was performed and materials expended, the amount of such lien, and the date of the filing of the notice of lien. No lien shall be continued by such extension for more than one year from the filing thereof. In the event an action is not commenced to foreclose the lien within such extended period, such lien shall be extinguished unless an order be granted by a court of record or a judge or justice thereof, continuing such lien, and a new docket be made stating such fact. No lien shall be continued by such order for more than one year from the granting thereof, but a new order and entry may be made in each of two successive years. If a lienor be made a party defendant in an action to enforce another lien, and the plaintiff or such defendant has filed a notice of the pendency of the action within the time prescribed in this section, the lien of such defendant is thereby continued. The provision of this section in regard to continuing liens shall apply to liens discharged by deposit or by order on the filing of an undertaking. This section is hereby declared to be a remedial statute and is to be construed liberally to secure the beneficial interests and purposes thereof. (1) By the certificate of the lienor, duly acknowledged or proved and filed in the office where the notice of lien is filed, stating that the lien is satisfied or released as to the whole or a portion of the real property affected thereby and may be discharged in whole or in part, specifying the part. Upon filing such certificate, the county clerk in the office where the same is filed, shall note the fact of such filing in the “lien docket” in the column headed “Proceedings had” opposite the docket of such lien. (2) By failure to begin an action to foreclose such lien or to secure an order continuing it, within one year from the time of filing the notice of lien, unless an action be begun within the same period to foreclose a mortgage or another mechanic’s lien upon the same property or any part thereof and a notice of pendency of such action is filed according to law, but a lien, the duration of which has been extended by the filing of a notice of the pendency of an action as herein provided, shall nevertheless terminate as a lien after such notice has been cancelled or has ceased to be effective as constructive notice. (3) By order of the court vacating or cancelling such lien of record, for neglect of the lienor to prosecute the same, granted pursuant to section fifty-nine of this chapter. a. The execution of any such bond or undertaking by any fidelity or surety company authorized by the laws of this state to transact business, shall be sufficient; and where a certificate of qualification has been issued by the superintendent of insurance under the provisions of section one thousand one hundred eleven of the insurance law, and has not been revoked, no justification or notice thereof shall be necessary. Any such company may execute any such bond or undertaking as surety by the hand of its officers, or attorney, duly authorized thereto by resolution of its board of directors, a certified copy of which resolution, under the seal of said company, shall be filed with each bond or undertaking. Any such bond or undertaking shall be filed with the clerk of the county in which the notice of lien is filed, and a copy shall be served upon the adverse party. The undertaking is effective when so served and filed. If a certificate of qualification issued pursuant to subsections (b), (c) and (d) of section one thousand one hundred eleven of the insurance law is not filed with the undertaking, a party may except, to the sufficiency of a surety and by a written notice of exception served upon the adverse party within ten days after receipt, a copy of the undertaking. Exceptions deemed by the court to have been taken unnecessarily, or for vexation or delay, may, upon notice, be set aside, with costs. Where no exception to sureties is taken within ten days or where exceptions taken are set aside, the undertaking shall be allowed. b. In the case of bonds or undertakings not executed pursuant to paragraph a of this subdivision, the owner or contractor shall execute an undertaking with two or more sufficient sureties, who shall be free holders, to the clerk of the county where the premises are situated. The sureties must together justify in at least double the sum named in the undertaking. A copy of the undertaking, with notice that the sureties will justify before the court, or a judge or justice thereof, at the time and place therein mentioned, must be served upon the lienor or his attorney, not less than five days before such time. Upon the approval of the undertaking by the court, judge or justice an order shall be made by such court, judge or justice discharging such lien. c. If the lienor cannot be found, or does not appear by attorney, service under this subsection may be made by leaving a copy of such undertaking and notice at the lienor’s place of residence, or if a corporation at its principal place of business within the state as stated in the notice of lien, with a person of suitable age and discretion therein, or if the house of his abode or its place of business is not stated in said notice of lien and is not known, then in such manner as the court may direct. The premises, if any, described in the notice of lien as the lienor’s residence or place of business shall be deemed to be his said residence or its place of business for the purposes of said service at the time thereof, unless it is shown affirmatively that the person servicing the papers or directing the service had knowledge to the contrary. Notwithstanding the other provisions of this subdivision relating to service of notice, in any case where the mailing address of the lienor is outside the state such service may be made by registered or certified mail, return receipt requested, to such lienor at the mailing address contained in the notice of lien. d. Except as otherwise provided in this subdivision, the provisions of article twenty-five of the civil practice law and rules regulating undertakings is applicable to a bond or undertaking given for the discharge of a lien on account of private improvements. (5) Upon the filing in the office of the clerk of the county where the property is situated, a transcript of a judgment of a court of competent jurisdiction, together with due proof of service of due notice of entry thereof, showing a final determination of the action in favor of the owner of the property against which the lien was claimed. (6) Where it appears from the face of the notice of lien that the claimant has no valid lien by reason of the character of the labor or materials furnished and for which a lien is claimed, or where for any other reason the notice of lien is invalid by reason of failure to comply with the provisions of section nine of this article, or where it appears from the public records that such notice has not been filed in accordance with the provisions of section ten of this article, the owner or any other party in interest, may apply to the supreme court of this state, or to any justice thereof, or to the county judge of the county in which the notice of lien is filed, for an order summarily discharging of record the alleged lien. A copy of the papers upon which application will be made together with a notice setting forth the court or the justice thereof or the judge to whom the application will be made at a time and place therein mentioned must be served upon the lienor not less than five days before such time. If the lienor can not be found, such service may be made as the court, justice or judge may direct. The application must be made upon a verified petition accompanied by other written proof showing a proper case therefor, and upon the approval of the application by the court, justice or judge, an order shall be made discharging the alleged lien of record. A lien specified in this article, other than a lien for performing labor or furnishing materials for a public improvement, may be discharged after the notice of lien is filed at any time before an action is commenced to foreclose such lien, by depositing with the county clerk, in whose office the notice of lien is filed, a sum of money equal to the amount claimed in such notice, with interest to the time of such deposit. After such deposit is made and the lien is discharged the county treasurer or any other officer with whom the money is deposited shall, within ten days thereafter, send a notice by mail to the lienor, at the address given in the lien, that such lien has been discharged by deposit. After action to foreclose the lien is commenced it may be discharged by a payment into court of such sum of money, as, in the judgment of the court or a judge or justice thereof, after at least five days’ notice to all the parties to the action, will be sufficient to pay any judgment which may be recovered in such action. Upon any such payment, the county clerk shall forthwith enter upon the lien docket and against the lien for the discharge of which such moneys were paid, the words “discharged by payment.” A deposit of money made as prescribed in this section shall be repaid to the party making the deposit, or his successor, upon the discharge of the liens against the property pursuant to law. All deposits of money made as provided in this section shall be considered as paid into court and shall be subject to the provisions of law relative to the payment of money into court and the surrender of such money by order of the court. An order for the surrender of such moneys to the lienor or depositor may be made by any court of record having jurisdiction of the parties. If no action is brought in a court of record to enforce such lien, such order may be made by any judge of a court of record. If application for such order is made by lienor it shall be on notice to the depositor; if made by the depositor then on notice to the lienor. 1. By filing a certificate of the lienor or his successor in interest, duly acknowledged and approved, stating that the lien is discharged. (a) When one year has elapsed since the filing of the notice of lien or an extension thereof, unless, before the expiration thereof, either an extension or an order continuing said lien has been filed in the office where the notices are filed, or a notice of the pendency of an action to enforce said lien has been filed as provided in section eighteen of this article. (b) When the period of time for which the lien has been continued by order has expired, unless, before the expiration thereof, either an order continuing said lien for a further period of time has been filed in the offices where the notices are filed, or a notice of the pendency of an action to enforce said lien has been filed as provided in section eighteen of this article. 3. By satisfaction of a judgment rendered in an action to enforce the lien. 3-a. Under the provisions of subdivisions four, five and six of this section a discharge of lien shall only operate to relieve the comptroller of the state or the financial officer of the public corporation or the officer or person with whom the lien is filed of any and all liability imposed upon such officer by reason of the filing of the lien. Such lien shall be a valid and subsisting lien for all other purposes until discharged as prescribed by the provisions of the other subdivisions of this section. 4. By the contractor applying without notice to the supreme court of this state or to any justice thereof or to the county judge of any county for an order discharging such lien and depositing with the comptroller of the state or the financial officer of the public corporation, or the officer or person with whom the notice of lien is filed, such a sum of money as is directed by a judge or a justice of the court, which shall not be less than the amount claimed by the lienor, with interest thereon for the term of one year from the time of making such deposit, and such additional amount as the judge or justice deems sufficient to cover all costs and expenses. The amount so deposited shall remain with the comptroller or such financial officer or other officer or person until the lien is otherwise discharged as prescribed in this section. a. The execution of any such bond or undertaking by any fidelity or surety company authorized by the laws of this state to transact business, shall be sufficient; and where a certificate of qualification has been issued by the superintendent of insurance under the provisions of section one thousand one hundred eleven of the insurance law, and has not been revoked, no justification or notice thereof shall be necessary. Any such company may execute any such bond or undertaking as surety by the hand of its officers, or attorney, duly authorized thereto by resolution of its board of directors, a certified copy of which resolution, under seal of said company, shall be filed with each bond or undertaking. Any such bond or undertaking shall be filed with the state or the public corporation with which the notice of lien is filed and a copy shall be served upon the adverse party. The undertaking is effective when so served and filed. If a certificate of qualification issued pursuant to subsections (b), (c) and (d) of section one thousand one hundred eleven of the insurance law is not filed with the undertaking, a party may except, to the sufficiency of a surety and by a written notice of exception served upon the adverse party within ten days after receipt, a copy of the undertaking. Exceptions deemed by the court to have been taken unnecessarily, or for vexation or delay, may, upon notice, be set aside, with costs. Where no exception to sureties is taken within ten days or where exceptions taken are set aside the undertaking shall be allowed. b. In the case of bonds or undertakings not executed pursuant to paragraph a of this subdivision, the owner or contractor shall execute an undertaking with two or more sufficient sureties, who shall be free holders, to the state or public corporation with which the notice of lien is filed. The sureties must together justify in at least double the sum named in the undertaking. A copy of the undertaking, with notice that the sureties will justify before the court, or a judge or justice thereof, at the time and place therein mentioned, must be served upon the lienor or his attorney, not less than five days before such time. Upon the approval of the undertaking by the court, judge or justice an order shall be made by such court, judge or justice discharging such lien. c. If the lienor cannot be found, or does not appear by attorney, then service under this subsection may be made as prescribed in paragraph c of subdivision four of section nineteen of this article for the service of an undertaking with notice of justification of sureties. Notwithstanding the other provisions of this subdivision relating to service of notice, in any case where the mailing address of the lienor is outside the state such service may be made by registered or certified mail, return receipt requested, to such lienor at the mailing address contained in the notice of lien. d. Except as otherwise provided in this subdivision, the provisions of article twenty-five of the civil practice law and rules regulating undertakings is applicable to a bond or undertaking given for the discharge of a lien on account of public improvements. 6. Where a contractor has to his credit with the state or with a public corporation, a sum of money by reason of an estimate due and payable to him, and where payment of such estimate is withheld because a notice of lien has been filed against his interest in said money, and where said money is in excess of the amount claimed in the notice of lien, the contractor may apply without notice to the supreme court of this state or to any justice thereof or to the county judge of any county, for an order discharging such lien and directing the comptroller of the state or the financial officer or person with whom the lien is filed, to retain from such estimate a sum of money, which shall not be less than the amount claimed by the lienor, with interest thereon for one year and such additional amount as the judge or justice deems sufficient to cover all costs and expenses and to immediately pay over the balance of such estimate to the contractor. The amount so retained shall be held by the comptroller or such financial officer or other officer or person until the lien is otherwise discharged as provided in this section. The application for the order may be made upon an affidavit of the contractor or his attorney and where there is of record an assignment of all moneys the written consent of such assignee must be presented to the court showing a proper case therefor. 6-a. Where a contractor has to his credit with the state, or with a public corporation, a sum of money by reason of an estimate due and payable to him, and where payment of such estimate is withheld because a notice of lien has been filed against his interest in said money, and where the amount due and payable under said estimate is at least one and one-half times in excess of the amount stated to be due in said notice of lien, the comptroller of the state or the financial officer or person with whom the notice of lien is filed, may pay said estimate, after deducting therefrom a sum which shall be one and one-half times the amount stated to be due in said notice of lien, and said sum so deducted shall be withheld until said lien is otherwise discharged, as provided in this section. 7. Where it appears from the face of the notice of lien that the claimant has no valid lien by reason of the character of the labor or materials furnished and for which a lien is claimed, or where the notice of lien is invalid by reason of failure to comply with the provisions of section twelve of this article, or where it appears from the public records that such notice has not been filed in accordance with the provisions of section twelve of this article, the contractor or any other party in interest, may apply to the supreme court of this state, or to any justice thereof, or to the county judge of the county in which the notice of lien is filed, for an order summarily discharging of record the alleged lien. A copy of the papers upon which application will be made together with a notice setting forth the court or the justice thereof or the judge to whom the application will be made at a time and place therein mentioned must be served upon the lienor not less than five days before such time. If the lienor can not be found, such service may be made as the court, justice or judge may direct. The application must be made upon a verified petition accompanied by other written proof showing a proper case therefor, and upon the approval of the application by the court, justice or judge, an order shall be made discharging the alleged lien of record. 8. By order of the court vacating or canceling such lien of record, for neglect of the lienor to prosecute the same, granted pursuant to section twenty-one-a of this article. A lien against the amount due or to become due a contractor from the state or a public corporation, for the construction or demolition of a public improvement, may be vacated and canceled by an order of the supreme court. Before such order shall be granted, a notice shall be served upon the lienor personally or, in such manner as the court may direct. Such notice shall require the lienor to commence an action to enforce the lien within a time specified in the notice, not less than thirty days from the time of service, or show cause at a special term of the supreme court in the judicial district embracing the county wherein the notice of lien is filed, at a time and place specified therein, why the notice of lien should not be vacated and canceled of record. Proof of such service and that the lienor has not commenced the action to foreclose such a lien, as directed in the notice, shall be made by affidavit, at the time of applying for such order. A building loan contract either with or without the sale of land, and any modification thereof, must be in writing and duly acknowledged, and must contain a true statement under oath, verified by the borrower, showing the consideration paid, or to be paid, for the loan described therein, and showing all other expenses, if any, incurred, or to be incurred in connection therewith, and the net sum available to the borrower for the improvement, and, on or before the date of recording the building loan mortgage made pursuant thereto, to be filed in the office of the clerk of the county in which any part of the land is situated, except that any subsequent modification of any such building loan contract so filed must be filed within ten days after the execution of any such modification. No such building loan contract or any modification thereof shall be filed in the register’s office of any county. If not so filed the interest of each party to such contract in the real property affected thereby, is subject to the lien and claim of a person who shall thereafter file a notice of lien under this chapter. A modification of such contract shall not affect or impair the right or interest of a person, who, previous to the filing of such modification had furnished or contracted to furnish materials, or had performed or contracted to perform labor for the improvement of real property, but such right or interest shall be determined by the original contract. The county clerk is entitled to a fee of twenty-five dollars, except in counties within the city of New York where the fee shall be fifty dollars, for filing such a contract or modification. Except where the county clerk maintains a block index, such contracts and modifications thereof shall be indexed in a book provided for that purpose, in the alphabetical order of the names of the persons to whom such loans shall be made. No assignment of the moneys due or to become due under a building loan contract, under the provisions of section twenty-six of this article, nor any payment to the holder of such assignment, shall be or be construed to be a modification of a building loan contract within the meaning of this section, and the execution and delivery of a bond and mortgage, under the provisions of section twenty-six of this article, or payments thereunder, shall not be or be construed to be the making of a building loan contract within the meaning of this section. Except that this section shall not apply to any mortgage taken by the home owner’s loan corporation, a corporation created under an act of congress, known as the “home owners’ loan act of nineteen hundred thirty-three”1 and the “home owners’ loan act of nineteen hundred thirty-three as amended,”1 and said mortgage shall have priority over any and all liens filed subsequent to the date of the recording of said mortgage whether or not the cash and/or bonds for which said mortgage has been taken as security, shall have been advanced at the time of the execution of such mortgage or subsequent thereto, and it shall not be necessary to execute and file any building loan contract or any other contract, in compliance with this section or any part thereof. Where the county clerk indexes liens in a block index, every building loan contract presented to the clerk for filing, in order to entitle the same to be filed, shall contain in the body thereof, or shall have endorsed thereon, a designation of the number of every block, on the land map of the county, which is affected by the building loan contract. The county clerk shall cause such building loan contract to be entered in the block index, under the block number of every block so designated. In cases where a building loan contract shall have been filed without such designation or with an erroneous designation, the county clerk, on presentation of proper proof thereof, shall enter such instrument in the proper index, under the proper block number of every block in which the land affected is situated, and shall, at the same time, make a note of such entry and of the date thereof in every place in which such instrument may have been erroneously indexed, opposite the entry thereof, and also upon the instrument itself, if the same be in his possession or produced to him for the purpose, and the filing of such instrument shall be constructive notice as to property in the block not duly designated at the time of such filing only from the time when the same shall be properly indexed. This article is to be construed liberally to secure the beneficial interests and purposes thereof. A substantial compliance with its several provisions shall be sufficient for the validity of a lien and to give jurisdiction to the courts to enforce the same. The mechanics’ liens specified in this article may be enforced against the property specified in the notice of lien and which is subject thereto and against any person liable for the debt upon which the lien is founded, as prescribed in article three of this chapter. (1).1 Except as provided in section five an assignee of moneys, or any part thereof, due or to become due under a contract for public improvement, whose assignment is duly filed prior to the filing of a notice of lien or assignment of every other party to the action, shall have priority over those parties to the extent of advances made upon such assignment before the filing of the notice of lien or assignment next subsequent to his assignment, but as to advances made subsequent to a notice of lien or assignment filed and unsatisfied or not discharged such assignee for the purpose of determining his proportionate share of moneys available for distribution as provided in subdivision four of this section shall be treated as a lienor having a lien to the extent of advances so made. (2) An assignee of moneys or any part thereof, due or to become due under a contract for a public improvement whose assignment is duly filed subsequent to the filing of the notice of lien or assignment of any other party shall for the purpose of determining his proportionate share of moneys available for distribution, as provided in subdivision four of this section be treated as a lienor having a lien to the extent of advances actually made upon such assignment prior to the filing thereof. (3) Laborers for daily or weekly wages having liens under a contract for a public improvement, shall have preference as a class for the full amount of their unpaid wages over all other lienors having liens arising under the same contract and without reference to the time when such laborers shall have filed their notices of liens. (4) There shall be no priority among labor lienors, as a class or among other lienors as a class, and any moneys available for distribution among lienors of any class shall be distributed pro rata in accordance with their respective valid liens. (5) Every assignment of moneys, or any part thereof, due or to become due under a contract for a public improvement shall contain a covenant by the assignor that he will receive any moneys advanced thereunder by the assignee and will hold the right to receive such moneys as a trust fund to be first applied to the payment of trust claims as defined in section seventy-one of the lien law, and that he will apply the same to such payments only, before using any part of the moneys for any other purpose. In case an owner of real property shall execute to one or more persons, or a corporation, as trustee or trustees, a bond and mortgage or a note and mortgage affecting such property in whole or in part, or an assignment of the moneys due or to become due under a contract for a building loan in relation to such property, and in case such mortgage, if any, shall be recorded in the office of the register of the county where such real property is situated, or if such county has no register then in the office of the clerk of such county, and in case such assignment, if any, shall be filed in the office of the clerk of the county where such real property is situated; and in case lienors having mechanics’ liens against said real property, notices of which have been filed up to and not later than fifteen days after the recording of such mortgage or the filing of such assignment, and which liens have not been discharged as in this article provided, shall, to the extent of at least fifty-five per centum of the aggregate amount for which such notices of liens have been so filed, approve such bond and mortgage or such note and mortgage, if any, and such assignment, if any, by an instrument or instruments in writing, duly acknowledged and filed in the office of such county clerk, then all mechanics’ liens for labor performed or material furnished prior to the recording of such mortgage or filing of such assignment, whether notices thereof have been theretofore or are thereafter filed and which have not been discharged as in this article provided, shall be subordinate to the lien of such trust bond and mortgage or such trust note and mortgage to the extent of the aggregate amount of all certificates of interest therein issued by such trustee or trustees, or their successors, for moneys loaned, materials furnished, labor performed and any other indebtedness incurred after said trust mortgage shall have been recorded, and for expenses in connection with said trust mortgage, and shall also be subordinate to the lien of the bond and mortgage or note and mortgage, given to secure the amount agreed to be advanced under such contract for a building loan to the extent of the amount which shall be advanced by the holder of such bond and mortgage or such note and mortgage to the trustee or trustees, or their successors, under such assignment. The provisions of this section shall apply to all bonds and mortgages and notes and mortgages and all assignments of moneys due, or to become due under building loan contracts executed by such owner, in like manner, and recorded or filed, from time to time as hereinbefore provided. In case of an assignment to trustees under the provisions of this section, the trustees and their successors shall be the agents of the assignor to receive and receipt for any and all sums advanced by the holder of the building loan bond and mortgage or the building loan note and mortgage under the building loan contract and such assignment. No lienor shall have any priority over the bond and mortgage or note and mortgage given to secure the money agreed to be advanced under a building loan contract or over the advances made thereunder, by reason of any act preceding the making and approval of such assignment. Upon the filing of the written instrument or instruments of approval under section twenty-six of this article, the lien of all money judgments and attachments affecting such real property, or the moneys due under a contract, and all claims and liens acquired in any proceedings upon any money judgment, shall be subordinate in like manner and to like extent as provided in said section for the subordination of mechanics’ liens, and any attachment issued or money judgment recovered upon a claim, which, in whole or in part, was not for materials furnished, labor performed or moneys advanced for the improvement of such real property or for the public improvement, shall be subordinate to all mechanics’ liens thereon and shall also be subordinate to all judgments recovered upon and attachments issued upon claims for materials furnished, labor performed or moneys advanced for the improvement of such real property. In case an owner of real property upon which an improvement is being or has been made, desires to obtain a loan by executing and delivering a bond or bonds or note or notes secured by a mortgage upon such real property, or any part thereof, and in case lienors having mechanics’ liens against such real property, or any part thereof, notices of which have been filed prior to the recording of such mortgage, and which said liens have not been discharged as in this article provided, shall, to the extent of at least fifty-five per centum of the aggregate amount for which notices of such liens have been so filed, by an instrument or instruments in writing, duly acknowledged, designate and authorize one or more persons to consent to the execution and delivery of such bond and mortgage or note and mortgage, and in case the consent in writing, duly acknowledged, of such person or persons to the execution and delivery of such bond and bonds and mortgage or note and notes and mortgage shall be filed in the office of the clerk of the county where such real property is situated, together with such instrument or instruments of designation, then all mechanics’ liens for labor performed and materials furnished prior to the recording of such mortgage whether notices thereof have been theretofore or are thereafter filed, shall be subordinate to the lien of such bond or bonds and mortgage or note or notes and mortgage to the extent of the full amount which shall be advanced thereunder provided such mortgage contains the covenant prescribed in subdivision three of section thirteen of this chapter. In case such person or persons so designated and authorized shall so consent to the execution and delivery of such bond and mortgage or note and mortgage but on condition that a sum of money be deposited with the clerk of such county, and such sum is so deposited, the county clerk, upon such payment, shall forthwith enter upon the lien docket, indexed with the name of the owner, the facts relating to such payment. A deposit of money made as prescribed in this section shall be repaid to such owner or his assignee upon the discharge or release of all mechanics’ liens, judgments and attachments against the property. All deposits of money made as provided in this section shall be considered as paid into court and shall be subject to the provisions of law relative to the payment of money into court and the surrender of such money by order of the court. The court shall in any action brought to foreclose any of such liens, or in any action brought to recover such deposit or any part thereof, direct the payment of such sum so deposited to the persons whose mechanics’ liens, judgments, or claims secured by attachment shall have been established on the trial and the amount so paid shall be credited upon such mechanics’ liens, judgments and claims. Upon such filing of such consent, as hereinbefore provided, the lien of all judgments and attachments affecting such real property and all claims and liens acquired in any proceedings upon such judgments shall be subordinate in like manner and to like extent as hereinbefore in this section provided for the subordination of mechanics’ liens, and any attachment issued or judgment recovered upon a claim, which, in whole or in part, is not for materials furnished, labor performed or moneys advanced for the improvement of such property shall be subordinate to all mechanics’ liens thereon, and shall also be subordinate to all judgments recovered upon and attachments issued upon claims for materials furnished, labor performed or moneys advanced for the improvement of such real property. Any lienor having a mechanic’s lien against real property may subordinate such lien to any subsequent mortgage thereon by a certificate duly acknowledged or proved stating that such lien is subordinated, which certificate shall be filed in the office where the notice of lien is filed. Upon filing such certificate, the county clerk in the office where the same is filed shall note the fact of such filing in the “lien docket” in the column headed “proceedings had,” opposite the docket of such lien. In case of subordination pursuant to the provisions of sections twenty-six, twenty-eight or twenty-nine of this article all actions and proceedings upon such mechanics’ liens and all notices of pendency of actions in any action brought to foreclose the same and all proceedings upon judgments and attachments, shall be subordinate in like manner and to like extent as provided in said sections, respectively, for the subordination of mechanics’ liens, judgments and attachments. In case an owner of real property upon which an improvement is being or has been made, desires to convey or transfer an interest in such real property or any part thereof, and in case lienors having mechanics’ liens against such real property, or any part thereof, notices of which were filed prior to the making of the deposit hereinafter in this section mentioned, and which said liens have not been discharged as in this article provided, shall, to the extent of at least fifty-five per centum of the aggregate amount for which such liens have been so filed, by an instrument or instruments in writing, duly acknowledged, designate and authorize one or more persons to consent to the execution and delivery of a deed or deeds conveying said real property or any part thereof, and in case the consent in writing, duly acknowledged, of such person or persons to the execution and delivery of such deed or deeds, and which said consent shall be conditioned for the deposit of a specified sum of money with the clerk of such county, shall be filed in the office of the clerk of the county where such real property is situated, together with such instrument or instruments of designation, then on the deposit of such specified sum with such county clerk all mechanics’ liens, judgments and attachments, and all claims and liens acquired in any proceeding upon such judgments or under such attachments against such real property shall from the time of such deposit cease to be liens or encumbrances upon such real property, and such real property shall thenceforth be free and discharged from the same, and the same shall thenceforth be liens upon such sum so deposited and said county clerk upon such deposit being made shall forthwith enter upon the lien docket, indexed with the name of such owner, the facts relating to such deposit. A deposit of money made as prescribed in this section shall be repaid to such owner or his assignee upon the discharge or release of all such mechanics’ liens, judgments and attachments. All deposits of money made as provided in this section shall be considered as paid into court and shall be subject to the provisions of law relative to the payment of money into court and the surrender of such money by order of the court. The court shall in any action brought to foreclose any of such liens or in any action brought to recover such deposit or any part thereof, direct the payment of such sum so deposited to the persons whose mechanics’ liens, judgments, or claims secured by attachment shall have been established upon the trial, and the amount so paid shall be credited upon such mechanics’ liens, judgments and claims. Upon such deposit being made as hereinbefore provided the lien of all judgments and attachments affecting such real property, and all claims and liens acquired in any proceedings upon such judgments or under attachments shall be liens upon such deposit. All judgments recovered upon the attachments issued upon a claim which, in whole or in part, is not for materials furnished, labor performed or moneys advanced for the improvement of such real property, shall be subordinate as a lien upon such sum so deposited to all mechanics’ liens thereon, and shall also be subordinate to all judgments recovered upon and attachments issued upon claims for materials furnished, labor performed or moneys advanced for the improvement of such real property. In case such consent shall be conditioned also for the giving to one or more persons or a corporation as trustee or trustees any other property real or personal then any cash thereafter from time to time tendered by such trustee or trustees to such county clerk shall be received and held by such county clerk as though the same were part of the specified sum of money for the deposit of which such consent was conditioned, and for the same purposes and subject to the same provisions as in this section provided therefor. The amendments contained in this act shall not apply to mechanics’ liens, building loan contracts, mortgages, assignments and orders referred to in section fifteen, attachments, judgments, or to claims or liens acquired in any action or proceeding upon such mechanics’ liens, building loan contracts, mortgages, assignments and orders, attachments or judgments, filed, recorded, docketed, entered or obtained, or to contracts for the improvement of real property made, prior to the date when this chapter, as amended, takes effect. None of the provisions contained in sections twenty-six, twenty-eight, twenty-nine and thirty-one of this article shall apply to liens of laborers for daily or weekly wages. The filing of a notice of lien shall not be a waiver of any right of arbitration of a contractor, subcontractor, material man or laborer secured to him by his contract to furnish labor or materials. In case the arbitrators, in any arbitration proceeding had pursuant to any such contract, shall determine the value or price of labor performed or material furnished, their award shall be conclusive as between all parties to the arbitration in any action to foreclose the lien. (1) The owner or contractor between whom a contract exists for the improvement of real property may, either before or after the commencement of the improvement, execute as a principal, a bond to the county clerk of the county where the premises are situated in such amount as the supreme court of this state, or any justice thereof, or the county court or the county judge of such county may direct, which shall not be less than the amount then unpaid under such contract, conditioned for the payment of any judgment or judgments which may be recovered in any action brought for the enforcement of any and all claims, notices of which may be filed as in this section provided, arising by virtue of labor performed or materials furnished in or about the performance of any such contract. As many such bonds may be executed as there are contractors employed upon the improvement. (2) Such a bond must be executed as a surety by a fidelity or surety company authorized to do business in this state, and to which a certificate of solvency has been issued and is unrevoked pursuant to section one thousand one hundred eleven of the insurance law. (3) Such bond shall recite the name of the owner, the name of the contractor, the name of the surety company, the date and amount of the contract, and shall contain a description of the real property upon which the improvement is to be made, is being made, or has been made; such description shall be sufficient if it complies with the requirements in respect thereto prescribed for a notice of lien. (4) Upon the approval of any such bond by such court, judge or justice thereof and upon the filing of such bond with the county clerk of the county where the real property is situated, an order shall be made by such court, judge or justice discharging such property from the lien of each and every contractor, subcontractor, material man or laborer performing labor or furnishing materials in or about the performance of the contract described in such bond. After the filing of such bond, the owner and the contractor named therein shall no longer be obligated to comply with the provisions of section eight of this chapter insofar as said provisions may relate to or in any way affect the contract, described in said bond, or the rights of any person performing labor or furnishing materials in or about the performance thereof. (5) A contractor, subcontractor, laborer or material man who performs labor or furnishes materials in or about the performance of the contract described in such bond shall have a claim, which shall attach against and be secured by such bond, for the principal and interest of the value, or the agreed price, of such labor and materials. Within the meaning of the provisions of this section, materials actually manufactured for but not delivered to the real property, shall also be deemed to be materials furnished. The claimant in order to perfect his claim shall within the time prescribed in this chapter for the filing of a notice of lien, file a notice of claim in the office of the clerk of the county where such bond is filed. Any such claimant who has so perfected his claim may bring an action on the bond for the enforcement thereof in any court where an action might have been brought if such claim were a lien filed against such real property. (6) The notice of claim shall state: (1) the name and residence of the claimant; and if the claimant is a partnership or a corporation, the business address of such firm, or corporation, the names of partners and principal place of business, and if a foreign corporation, its principal place of business within the state; (2) the names of the owner, contractor and surety named in the bond; (3) the name of the person by whom the claimant was employed or to whom he furnished or is to furnish materials; (4) the labor performed or materials furnished, including also materials actually manufactured for but not delivered to the real property, and the agreed price or value thereof; (5) the amount unpaid to the claimant for such labor or materials; (6) a description of the real property such as is required for a notice of lien. The notice of claim shall be verified by the claimant or his agent in the form required for the verification of notices in section nine of this chapter. (7) The plaintiff in such an action must, prior to the commencement thereof, file in the office of the clerk of the county where the bond is filed, the summons and complaint in such action and shall join as parties defendant, the principal and surety on the bond, the contractor, and all claimants who have filed notices of claim prior to the date of the filing of such summons and complaint. In case a claimant files his notice of claim on or after the date of such filing of such summons and complaint he may be brought in by amendment at any time up to and including the time and in the manner and under the conditions that a lienor may be brought into an action to foreclose a lien pursuant to section sixty-two of this chapter. (8) The court may adjust and determine the equities of all the parties to the action and render an appropriate judgment. In case a counterclaim is set forth by any defendant, such defendant shall be deemed to have waived a trial by jury of the issues raised thereby. (9) An action upon such a bond shall be begun within one year after the completion of the improvement, or if the work thereon is abandoned, then within two years after the last item of work was performed or the last item of materials was furnished by the claimant. The beginning of the action by the plaintiff-claimant shall be deemed a bringing of the action by each defendant-claimant made a party thereto. (10) The county clerk of each county shall provide and keep a book called the “lien bond docket,” which shall be suitably ruled in columns headed “owner,” “contractor,” “claimant,” “property,” “surety,” “amount of bond,” “time of filing,” “amount of claim,” “proceedings had,” in each of which he shall write the particulars of the notice of claim property1 belonging therein. The date, hour and minute of the filing of notice of each claim and of the filing of the summons and complaint in any action commenced on said bond shall be entered in the proper column. The names of the owners shall be arranged in such book in alphabetical order. The validity of the claim and the right to file a notice thereof shall not be affected by the death of the principal before notice of the claim is filed. (11) In the event that notwithstanding the provisions of this section a contractor, subcontractor, material man or laborer, whose lien has been discharged in the manner provided in this section, shall thereafter file a notice of lien against the real property, then upon application of the owner or contractor to the supreme court of this state or any justice thereof or the county court or the county judge of the county where such notice of lien is filed and upon proof that the bond approved and filed as in this section provided secures the payment of the claim set forth in any such notice of lien, the court, justice or judge thereof shall make an order discharging such lien. In any such case a copy of the bond and notice of the time and place of making such application for such order to discharge any such lien shall be served upon the lienor or his attorney not less than two days before such time. (12) A claim which has been perfected by the filing of a notice of claim may be discharged as follows: (1) By the certificate of the claimant duly acknowledged or proved and filed in the office where the notice of claim is filed, stating that the claim is satisfied and may be discharged; (2) By failure to begin an action as and within the time provided in this section. A lienor who has filed a notice of lien shall, on demand in writing, deliver to the owner or contractor making such demand a statement in writing which shall set forth the items of labor and/or material and the value thereof which make up the amount for which he claims a lien, and which shall also set forth the terms of the contract under which such items were furnished. The statement shall be verified by the lienor or his agent in the form required for the verification of notices in section nine of this chapter. If the lienor shall fail to comply with such a demand within five days after the same shall have been made by the owner or contractor, or if the lienor delivers an insufficient statement, the person aggrieved may petition the supreme court of this state or any justice thereof, or the county court of the county where the premises are situated, or the county judge of such county for an order directing the lienor within a time specified in the order to deliver to the petitioner the statement required by this section. Two days’ notice in writing of such application shall be served upon the lienor. Such service shall be made in the manner provided by law for the personal service of a summons. The court or a justice or judge thereof shall hear the parties and upon being satisfied that the lienor has failed, neglected or refused to comply with the requirements of this section shall have an appropriate order directing such compliance. In case the lienor fails to comply with the order so made within the time specified, then upon five days’ notice to the lienor, served in the manner provided by law for the personal service of a summons, the court or a justice or judge thereof may make an order canceling the lien. In any action or proceeding to enforce a mechanic’s lien upon a private or public improvement or in which the validity of the lien is an issue, if the court shall find that a lienor has wilfully exaggerated the amount for which he claims a lien as stated in his notice of lien, his lien shall be declared to be void and no recovery shall be had thereon. No such lienor shall have a right to file any other or further lien for the same claim. A second or subsequent lien filed in contravention of this section may be vacated upon application to the court on two days’ notice. Where in any action or proceeding to enforce a mechanic’s lien upon a private or public improvement the court shall have declared said lien to be void on account of wilful exaggeration the person filing such notice of lien shall be liable in damages to the owner or contractor. The damages which said owner or contractor shall be entitled to recover, shall include the amount of any premium for a bond given to obtain the discharge of the lien or the interest on any money deposited for the purpose of discharging the lien, reasonable attorney’s fees for services in securing the discharge of the lien, and an amount equal to the difference by which the amount claimed to be due or to become due as stated in the notice of lien exceeded the amount actually due or to become due thereon. If for any reason after the work of a private or a public improvement of real property is abandoned by an owner, a contractor or a subcontractor before the completion thereof by such owner, contractor or subcontractor, or if, after the same is completed, materials delivered are not used therefor, a person who has delivered materials for the improvement which have not been incorporated therein and for which he has not received payment may repossess and remove such materials; and thereupon he shall have no lien on the real property or improvements against persons secondarily liable, for the price thereof, but he shall have the same rights in regard to the materials as if he had never parted with the possession. This right to repossess and remove the materials shall not be affected by their sale, encumbrance, attachment, or transfer from the site of the improvement, except that, if the materials have been so transferred, the right to repossess them shall not be effective as against a purchaser or encumbrancer thereof in good faith whose interest therein shall have arisen since such transfer from the site of the improvement, or as against a creditor attaching after such transfer. The right to repossession and removal given by this section shall extend only to materials whose purchase price does not exceed the amount remaining due to the person repossessing; but where materials have been partly paid for, the person delivering them may repossess them as allowed in this section on refunding the part of the purchase price which has been paid less the cost of removal.